News | Why Do Some Galactic Unions Lead to Doom? 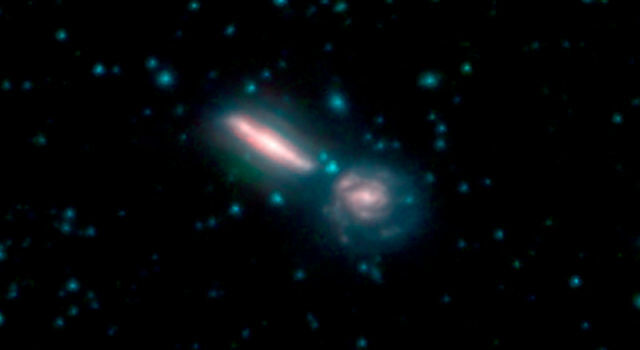 Three images from NASA's Spitzer Space Telescope show pairs of galaxies on the cusp of cosmic consolidations. Though the galaxies appear separate now, gravity is pulling them together, and soon they will combine to form new, merged galaxies. Some merged galaxies will experience billions of years of growth. For others, however, the merger will kick off processes that eventually halt star formation, dooming the galaxies to wither prematurely. Only a few percent of galaxies in the nearby universe are merging, but galaxy mergers were more common between 6 billion and 10 billion years ago, and these processes profoundly shaped our modern galactic landscape. For more than 10 years, scientists working on the Great Observatories All-sky LIRG Survey, or GOALS, have been using nearby galaxies to study the details of galaxy mergers and to use them as local laboratories for that earlier period in the universe's history. The survey has focused on 200 nearby objects, including many galaxies in various stages of merging. The images above show three of those targets, imaged by Spitzer. In these images, different colors correspond to different wavelengths of infrared light, which are not visible to the human eye. Blue corresponds to 3.6 microns, and green corresponds to 4.5 microns - both strongly emitted by stars. Red corresponds to 8.0 microns, a wavelength mostly emitted by dust. One of the primary processes thought to be responsible for a sudden halt in star formation inside a merged galaxy is an overfed black hole. At the center of most galaxies lies a supermassive black hole - a powerful beast millions to billions of times more massive than the Sun. During a galactic merger, gas and dust are driven into the center of the galaxy, where they help make young stars and also feed the central black hole. But this sudden burst of activity can create an unstable environment. 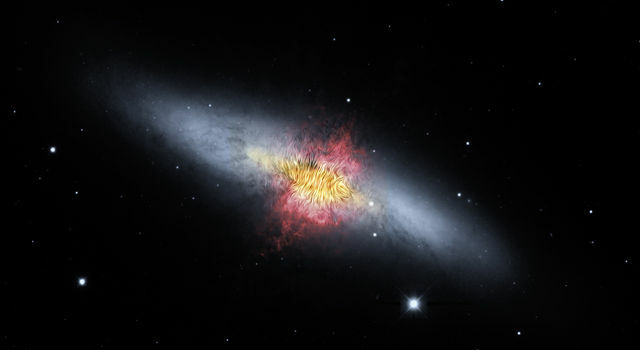 Shockwaves or powerful winds produced by the growing black hole can sweep through the galaxy, ejecting large quantities of gas and shutting down star formation. 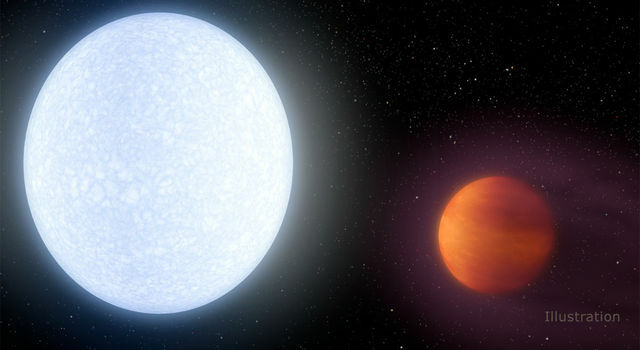 Sufficiently powerful or repetitive outflows can hinder the galaxy's ability to make new stars. The relationship between mergers, bursts of star formation, and black hole activity is complex, and scientists are still working to understand it fully. One of the newly merged galaxies is the subject of a detailed study with the W.M. 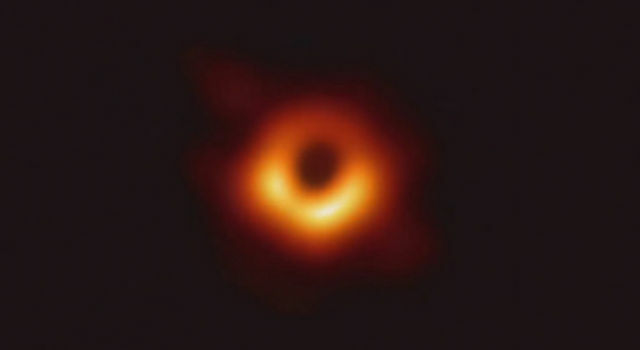 Keck Observatory in Hawaii, in which GOALS scientists searched for galactic shockwaves driven by the central active galactic nucleus, an extremely bright object powered by a supermassive black hole feeding on material around it. The lack of shock signatures suggests that the role of active galactic nuclei in shaping galaxy growth during a merger may not be straightforward. 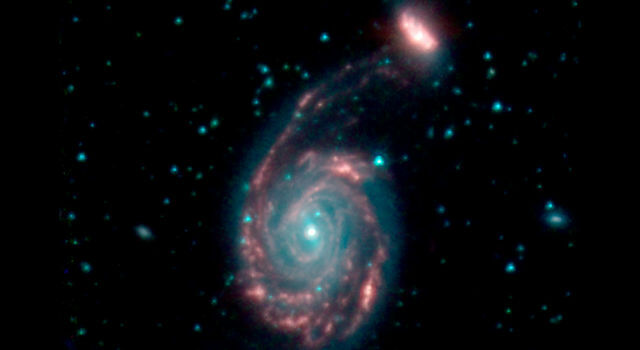 Merging galaxies in the nearby universe appear especially bright to infrared observatories like Spitzer. 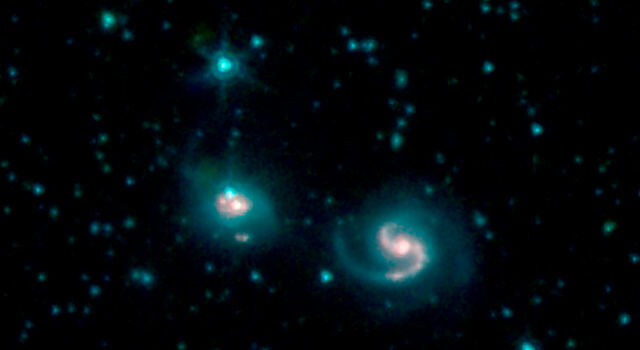 GOALS studies have also relied on observations of the target galaxies by other space-based observatories, including NASA's Hubble and Chandra space telescopes, the European Space Agency's Herschel satellite, as well as facilities on the ground, including the Keck Observatory, the National Science Foundation's Very Large Array and the Atacama Large Millimeter Array. 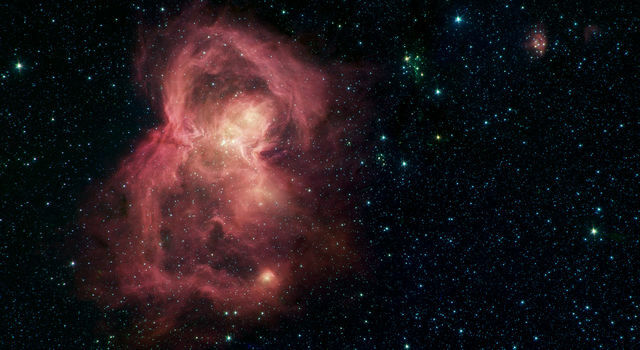 JPL manages the Spitzer Space Telescope mission for NASA's Science Mission Directorate in Washington. Science operations are conducted at the Spitzer Science Center at Caltech in Pasadena, California. Spacecraft operations are based at Lockheed Martin Space in Littleton, Colorado. Data are archived at the Infrared Science Archive housed at IPAC at Caltech.